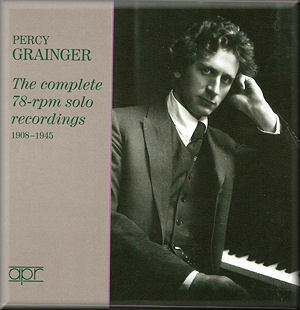 Here’s something a little bit special to mark the fiftieth anniversary of the death of Percy Grainger. It’s his complete surviving 78 recordings, a series that began in 1908 and ended in 1945. The earliest discs were made for the Gramophone Company in London, and the last for American Decca. Grainger was a charismatic pianist and also a discographic pioneer. He was entrusted with some important ‘first ever’ recordings, as will be seen later. His status as a composer-executant was also acknowledged, though lovers of his music will be disappointed to see how few of his pieces he actually recorded. And these few, mainly the favourites that we all know and love, were re-recorded, sometimes multiply over the years for the same or indeed different record companies. This was not surprising. He would be asked to take advantage of improved techniques, either the much vaunted improved ‘quieter surfaces’ of the time, or then electric recording, and then finally when Decca compiled an album set of his music and that of composers whose music he wished to record. So this set will appeal both to collectors of historic piano recordings, but also to admirers of the composer, though it is strongly weighted in favour of the former, not least in terms of repertoire. There are five discs, packed to the gills. They’re not presented in strict session or chronological order, though the sessions themselves are presented chronologically. For example, he recorded the Stanford-Grainger Maguire’s Kick on 16 May 1908 before he recorded the first movement cadenza from Grieg’s Piano Concerto, but the first disc of this set starts with the latter. This was a fine gesture, by both Grainger and the record company, as Grieg, a great friend of Grainger’s, had died the previous year. Later the sequence is re-jigged to allow a run of pieces by the same composer - the Grieg recordings of the 1917-24 period for instance run together, as indeed do Grainger’s own, though they weren’t all made at the same time. This makes programming sense, and I approve, but anyone who should want to experience the recordings in matrix order can re-programme things to do so. It’s a fascinating experience following Grainger down the road of his recorded career. He first recorded his own music in July 1914 - it was Shepherd’s Hey and Mock Morris - and at the same session he also recorded Debussy’s Toccata from Pour le piano, adventurous stuff for the time. By 1917 he was in America and recording for Columbia. There are two issued takes of Chopin’s Prelude in A major; the second has more rubato. Inevitably there was a fair amount of abridgement in those days, so the same composer’s Polonaise in A flat major is condensed to fit one side of a 78. In addition to the Chopin that he recorded between 1917 and 1924, he also added three Liszt Hungarian Rhapsodies to the torso of the Twelfth Rhapsody that he’d recorded back in 1908 at his first session. Here too he was something of a pioneer. The second disc continues with the 1917-24 recordings, all acoustic therefore. There is a lively cross-section of composers represented; Guion and Dett, both of whom Grainger liked playing and indeed recording, as well as the more expected Brahms, Sinding and MacDowell. There is more Grieg, including two different recordings of the Norwegian Bridal Procession (1919 and 1921), and more Grainger-plays-Grainger. There are two takes each of Country Gardens and Shepherd’s Hey from 1918, and a beautiful rendition of Spoon River from August 1922 and One More Day, My John from 1919. Working out Grainger’s major studio undertakings in the electric era from their matrix numbers and recording dates is a useful task. He clearly had one major sonata project per year. He recorded Chopin’s Third Sonata in June 1925, Brahms’s Third Sonata in January-February 1926, Schumann’s Second Sonata in June 1927, and then in 1928 both Schumann’s Études symphoniques in May and Chopin’s Second Sonata in September. Other projects may not have been issued but I’ve not seen a Grainger discography. These were all significant additions to the discography of the time; the Brahms, Schumann Second and Chopin Third being in fact, first ever recordings. The two Schumann recordings are on the third CD and provide strong evidence of his affiliations in this music, though he’s more impressive in the sonata. In the Études he lacks the requisite sense of fantasy. Similarly the two Chopin sonatas are programmed together on the fourth disc, and make an instructive pairing. The B minor is an example of Grainger at his acute and dynamic best, reminiscent of his performance of the Brahms sonata, on the last disc. In both he is magnificent, and the fact that he’s far from note perfect should not detain one long. This is galvanizing interpretative playing, full of insight and drama, and remarkable tonal qualities too. For some reason however, and this is a famous example of a misfire, Grainger’s sweep didn’t extend to Chopin’s B flat minor sonata, which never really gets going as an interpretation and remains limp. Far, far better is the series of hyphenated Bach recordings he made in 1931; Busoni-Grainger in the case of the Toccata and Fugue in D minor and Liszt in the other two represented, the Prelude and Fugue in A minor, and the Fantasia and Fugue in G minor. These rise to coruscating heights. A series of remakes, in the main, ends disc four; Chopin’s Etude in B minor, Brahms’s Waltz in A flat major, Grieg’s Wedding Day at Troldhaugen, To Spring, and Grainger’s own One More Day, My John. The final disc gives us one of the choicest morsels from his own work, Blithe Bells, which was actually issued in the Bach album set mentioned above. The Strauss-Grainger Rosenkavalier ramble is also a delight in the pianist’s hands and we are also fortunate to hear quite a rare 1929 recording of his Jutish Medley, complete on two 78 sides. His 1945 album for Decca was of his own favourites, and pieces such as Dett’s Juba Dance and Prelude: Night from a suite called In the Bottoms. Grainger also got the chance to record pieces by his old friend Cyril Scott, whose music he’d never before recorded; Lento from the Pierrot Pieces, Danse nègre and Cherry Ripe. The transfers have been effected with great skill by Ward Marston. He could do little with the rough start to Maguire’s Kick, but to his credit doesn’t try to disguise the difficulty except through his own skill. The fine booklet note is by that doyen of Grainger biographers and scholars, John Bird. So, a wonderful set.